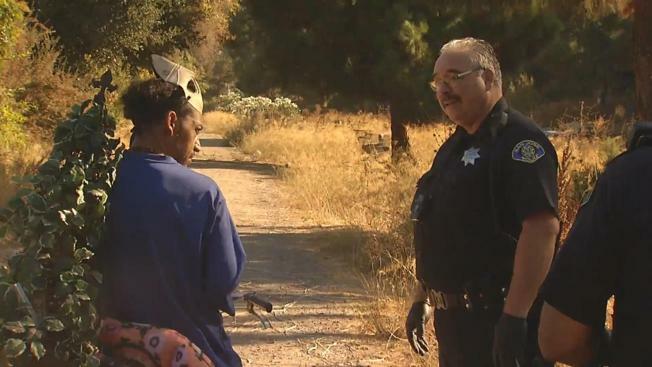 San Jose police are looking into a string of homeless homicides in the South Bay this year to see if they may be connected in some way. The wave of violence brought out police in droves Wednesday to try to solve a rash of slayings of homeless people. Investigators are trying to connect the dots to see if they could be connected to one suspect. On Tuesday, a man was found stabbed to death next to Interstate 280 in San Jose. It was the eighth killing of a homeless man in San Jose this year. The killing has similarities to two other recent homeless homicides, and detectives are worried. Police questioned several of the homeless living in a nearby encampment near Mclaughlin Avenue and 280. They took pictures, eager to solve what may be related slayings. "Our strategy at SJPD is to work like a wolfpack," said police spokesman Sgt. Enrique Garcia. One victim was struck by a car, four were either shot or beaten to death, and three were stabbed within a mile and a half of each other. Police are not saying whether they believe the killings are connected, but they're not ruling it out. "It's definitely something we're looking into," Garcia said. The mere notion that they could be the target of a killer has some homeless people terrified, fearing they could be next. "I think to some degree it's entirely predictable because the homeless are some of the population that are most at risk in the city," homeless advocate Shaunn Cartwright said. Police said one of the eight recent homicides has been solved. That was the victim who was struck by a car. Jan. 15. Unidentified 62-year-old San Jose man was struck by a full-size pickup truck at Santa Clara Street and Delmas Avenue. Suspect Ernest Cervantes, 79, was arrested on Jan. 21. May 22. Victim Randy Ruiz, 37, was stabbed to death in the 200 block of North Jackson Avenue. July 17. Victim Gilberto Garcia, 49, was stabbed to death in the 400 block of North First Street. Aug. 12. Victim Alejandro Sacarias, 41, was found dead at the northbound Highway 101 connector ramp to northbound Interstate 280, killed by blunt force trauma. Aug. 25. Victim Victor Trejo, 44, was found dead in the area of Herald and Bonita avenues, killed by blunt force trauma. Aug. 27. Victim Ricardo Michel, 24, was stabbed to death in the area of Bascom Avenue and Leon Drive. Sept. 20. Victim Brandin Gaviola, 25, was shot to death in the 3100 block of Lone Bluff Way, near Los Lagos Golf Course. Sept. 27. Victim Valentine Cortesosguera, 61, was found stabbed to death in a field in the 800 block of Jeanne Avenue, north of Interstate 280.